We’re thrilled to introduce you to our new year-long volunteers! 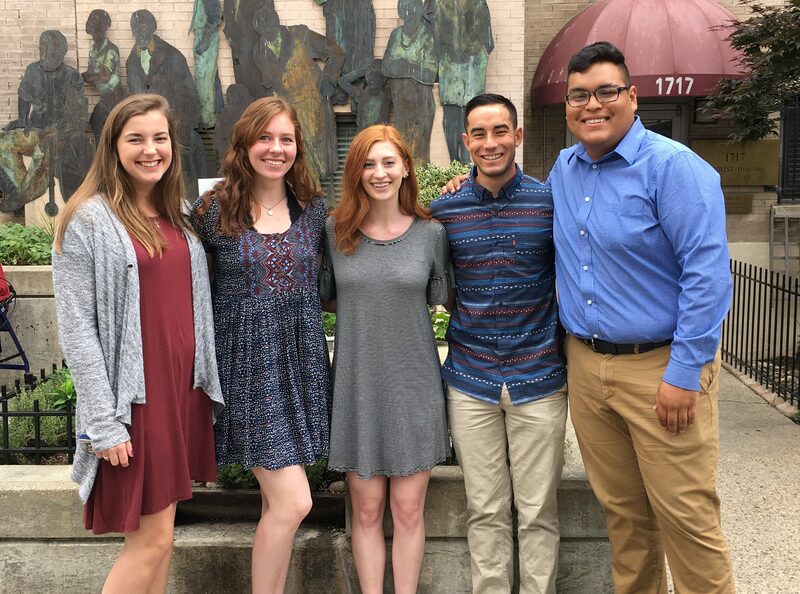 These five talented and passionate individuals will play a central role in the Christ House mission over the next twelve months. Sarah will serve for a second year as the Case Management Assistant. She will continue to support the Case Management department by helping patients to obtain public benefits, such as health insurance or Social Security benefits, and other social services, including mental health treatment and legal support. Some of Sarah’s favorite things include coffee, mac and cheese, and Villanova basketball. Christ House has been a wonderful blessing in her life over the past year, and she is eager to continue to grow in her case management experience, as well as in the larger Christ House community. Caroline will serve as a Homeless Respite Care Assistant. She will support the nursing staff by providing direct patient care. She will assist patients with activities of daily living, record vital signs, perform dressing changes, and more. Caroline started dancing when she was 3 years old and was on the LMU Cheer team. Other things she loves to do are working out, playing board games, baking, and traveling! Alyssa will serve as a Registered Nurse. She will work alongside our clinical staff to provide holistic care for our patients. She will provide wound care, interpret vital signs, handle patient medication, provide patient education, and more. Some of Alyssa’s favorite things are macaroni & cheese, local coffee shops, and road trips. She also loves to work out and watch a good series on Netflix. She is so excited and ready for this adventure! Brian will also serve as a Homeless Respite Care Assistant. He will support the nursing staff by providing direct patient care. He will assist patients with activities of daily living, record vital signs, perform dressing changes, and more. With a love for adventure, Brian enjoys hobbies ranging from hiking and the great outdoors to sampling novel foods in faraway places. He looks forward to a year filled with compassion, kinship, and laughter! Eric will serve as the Clinical Unit Assistant. He will serve as the first point of contact for everyone who enters the medical unit and assist with daily organization and health information management on the nursing unit. Eric loves outdoor adventures like hiking or mountain climbing. He also loves indoor activities like playing the piano and watching shows on Netflix. His favorite genre of music is alternative rock. Please join us in welcoming these newest members of the Christ House community!